A vivid pair of SPECIMEN Hornling 26″ Hi-Fi Stereo Speakers and SPECIMEN custom Hi-Fi Stereo Tube Amplifier are the centerpiece. On view at Chicago’s O’Hare Airport International terminal. 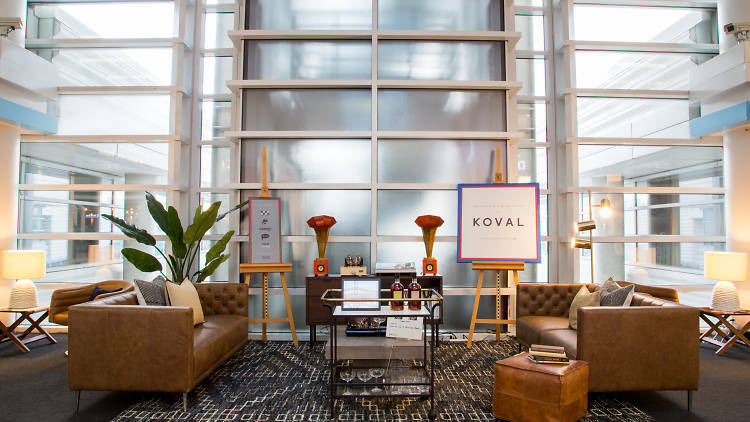 Koval Distillery and CB2 teamed up to create Chicago’s Living Room, a monthlong pop-up event located in Terminal 5. The space, outfitted with comfy furniture, allows weary travelers to grab a seat and sample Koval’s organic spirits. While you sip Koval and fantasize about all the nice, grownup furniture, you can enter to win a $1,000 CB2 gift card by posting a photo to Instagram and using the hashtag #CB2xKovalLounge. The boozy pop-up event is open from 1 to 7pm daily through the end of September 2017, for all your travel needs. Chicago record labels Numero Group (Sept 4), Drag City (Sept 11), Bloodshot (Sept 18), Thrill Jockey (Sept 25) and Trouble in Mind (Sept 28) will offer daylong vinyl takeovers to complete the atmosphere. 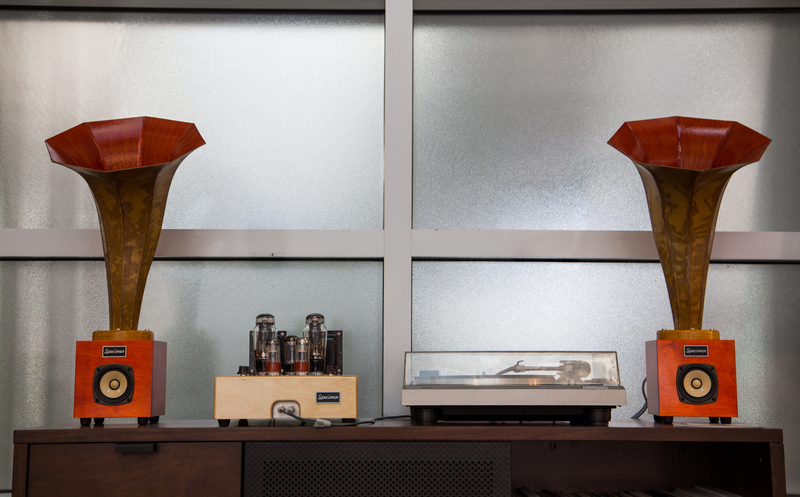 The Koval distillery enlisted audio system manufacturer Specimen Products to bring in a custom made SPECIMEN Stereo Hi-Fi Tube Amplifier and SPECIMEN Hornling Hi-Fi Speakers.